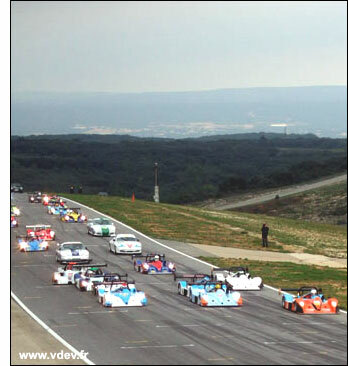 The main race at the French track this weekend is the 12 hour race, starting at 14.00 on Saturday afternoon, October 28. There's a huge grid (below) of prototypes and GTs, including some very familiar names. Not on the official list yet is one Thomas Erdos, who's partnering Simon Phillips and Rob Garofall in the former's Norma. Notice that Nigel Greensall pops up twice, we've got Saulnier Racing, Le Mans veteran Max Cohen-Olivar, Philipe Hesnault, Eric Helary, Frank Hahn, Philippe Haezebrouck and a bunch of other prototype and GT racers - all looking to get in as many miles as possible before winter takes over. This is the field getting underway at Ledenon a few weeks ago. There's a full programme of events throughout the weekend. 10 M15 DA ROCHA Frédéric Norma M20 evo CN 2006 DA ROCHA Frédéric (F) IBANEZ Frédéric (F)	CAVAILLES W.